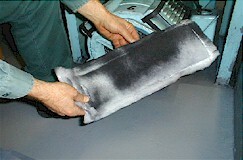 Simple "cost effective solution" to eliminate carbon dust, caused from brush wear. Eliminate carbon dust cleanup which is expensive in man-hoursand will help to promote customer satisfaction. 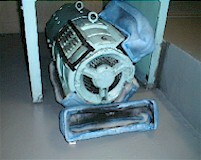 Prevent callbacks for circuit board failure and leveling problems are due to shorts or fouling by carbon dust. Designed to operate with "0" temperature increase, with filters fully loaded. 105 different filters systems designed specifically for each motor generator frame size and configuration. Have passed a # 302 automotive test for flammability. add it to our product line.